The French have given the world many treasures in the form of history, art and architecture. World-famous artists have retreated to the French Countryside for inspiration. In fact, Claude Monet's impressionist paintings were inspired by the French Countryside in Giverny, Normandy which in the latter part of his life became his home and main source of inspiration for many of his world-famous paintings. Our French Garage Door Collection, The French Campestral, is our tribute to that same French Country Architectural style that has inspired the world to create legendary art and historical accomplishments. 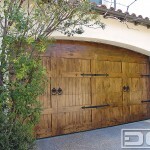 Our French Style Garage Doors are exquisitely designed to incorporate natural materials such as reclaimed wood species, hand-distressed wood, rustically ornate iron hardware crafted in the authentic French techniques that have enchanted generations. 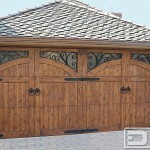 Dynamic Garage Door's unique French Garage Door designs are artistically inspired by the French Countryside and such inspiration culminates in much more than just a garage door! 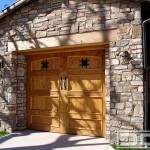 Discover the charming details that we incorporate into our French Garage Doors in this short gallery of examples. 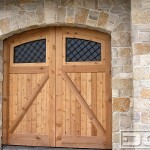 You'll find various French architectural door styles ranging from French Country, French Chateau and French Provincial. Our French Country Garage Doors will often be designed in rustic materials such as reclaimed woods beautifully embellished with rustic hand-forged hardware we craft to replicate original hardware seen throughout France's countryside historical homes. The French Chateau Garage Doors will often be exquisitely ornate with very fine details usually accompanied with highly detailed hardware in precious metals. We often source authentic antique European hardware for the French Chateau Style garage doors or contact our European hardware dealer for specific pieces imported from Europe. 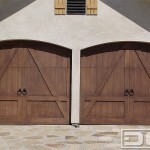 French Provincial Garage Doors will also have refined lines and typically a great fit for a countryside French villa with fabulous carpentry finishing and specialized wood finishes that enhance the beauty of each custom garage door we manufacture!